This is a Sponsored post about Thanksgiving Side Dishes written by me on behalf of Sam’s Club. All opinions are 100% mine. This Halloween my middle guy was home with strep and could not go trick or treating. He said Halloween was his second favorite holiday. When we asked him what his other favorite was he said Christmas. Then he asked his dad and me separately. We both said our favorite holiday was Thanksgiving. Baffled by our answer, he asked why we chose Thanksgiving over Christmas. We both adore Thanksgiving because it is a holiday away from presents and retail hoopla, (unless you consider the grocery ads). It is a time that we bring our family together and often invite friends over to celebrate with us. Even though I do most of the cooking, it is not a burden because it is so much about the sharing of a meal that I love the fact I have put some love and attention to each dish. With only 22 days until Thanksgiving I better get our menu started and start thinking about getting the ingredients in the house before the big rush. Obviously it will not be anything perishable before then but then I only have to hit the market for a few last-minute things. I recently rejoined Sam’s Club for another blog post and just the other day noticed the large display of Thanksgiving Side Dish displays around the store. I am going to try their stuffing recipe this year. You can find more recipes here. One of my favorite Thanksgiving sides is the traditional Green Bean Casserole. You know the one with green beans and condensed soup cans. I have not made this in a long time and think I might just have to mix things up this year and adjust this one to make it a little more healthy. Although who is really counting calories on Thanksgiving. Another keeper this Thanksgiving is a Sea Salt Sweet Potato Recipe I recently made to go along side a Skirt Steak we BBQ’d. 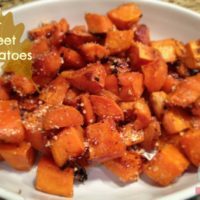 It was so simple but we gobbled it up and if you like sweet potatoes you are going to love them roasted. This sweet and salty Sweet potato Recipe will having you begging for more. Great recipe! Can’t wait to try this. Yummy! I can’t wait for Thanksgiving! That’s a new idea – looks great. Putting that in the “to-make” file!! I can’t wait until Thanksgiving! We are having a huge spread this year. 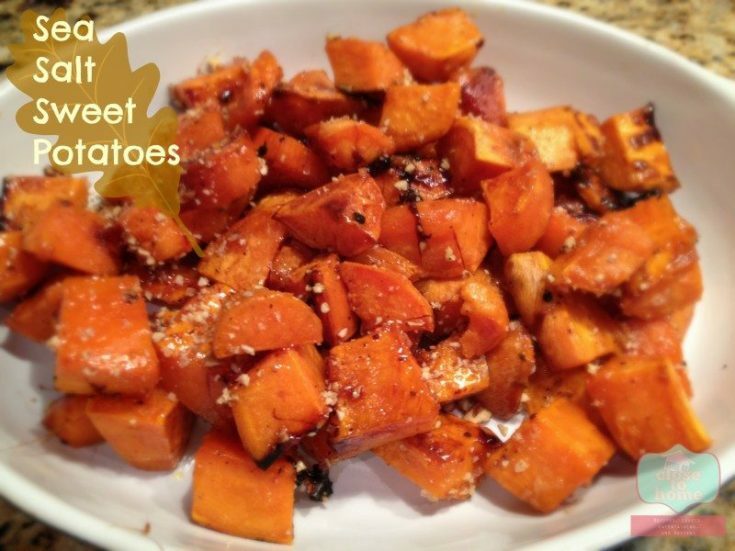 I would love to add this Sweet Potato recipe into the mix. Thank you.